(McAllen) - Noting his strong support for public safety and working families, the McAllen Fire Fighters Association and its statewide organization, the Texas State Association of Fire Fighters, have endorsed Sergio Muñoz, Jr. for State Representative, House District 36. House District 36 includes Granjeno, Hidalgo, southern McAllen, most of Mission, Palmview, Peñitas, and Pharr. "We, the 139 members of the McAllen Fire Fighters Association Local 2602, are proud to present you with this letter of endorsement," Amado Cano, general president of the area group, stated in its support for Muñoz. "We feel that with your personnel beliefs, education and experience you will be a positive influence to the State Representative Office and the citizens of District 36. We look forward to working with you during your campaign and would like to offer our assistance, as well as our endorsement." Mike Higgins, the chief-of-staff and legislative director for the Texas State Association of Fire Fighters, said the local support for Muñoz also brought a statewide endorsement from his group, which represents more than 15,000 professional fire fighters and 169 affiliate locals. The statewide show of support reflects the legislative policies of Muñoz, a successful lawyer and Palmview Municipal Court Judge, to be "a strong supporter of public safety and fire fighters across Texas,"
The Texas State Association of Fire Fighters was established in 1938 and it is Texas's only professional, career fire fighters organization. The Texas State Association of Fire Fighters is affiliated with the International Association of Fire Fighters. Muñoz said he was grateful for the endorsements, noting that protecting the public is one of the most important responsibilities of the Texas Legislature. "Fire fighters, like police, emergency medical service personnel, and other law enforcement professionals have my highest admiration – these are the brave men and women who rush into danger to save our lives, our homes and our businesses," said Muñoz. "I look forward to working with them on all major legislation that helps and protect them, because that will help and protect all of us." Political announcement paid for by Sergio Muñoz, Jr., – Óscar Elizondo, Jr., Treasurer – 1110 South Closner Boulevard, Edinburg, Texas 78539. NOTE: RGV LIFE does not receive any compensation for posting. It is posted as a public service. Hope to see you all tomorrow!!! PLEASE NOTE: The HUB City Toastmasters meet each Wednesday at 12.00 Noon at the Pharr Chamber of Commerce, 308 W. Park. This news letter is being sent to members and to guests who have visited or may be interested in visiting our meetings. If you do not wish to continue receiving these newsletters, just click reply, type cancel and send. Thank you. 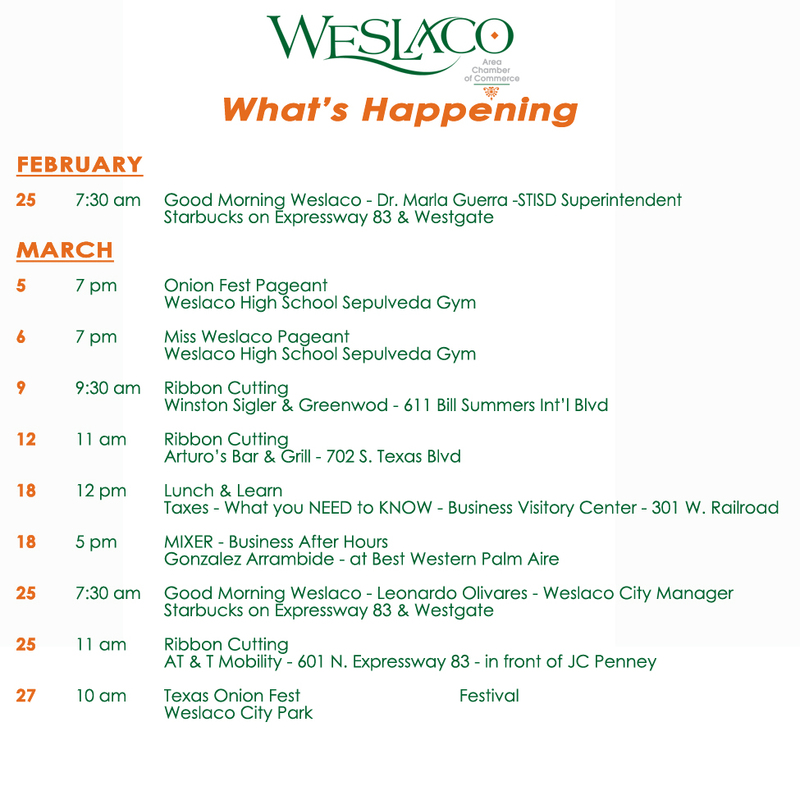 We are WESLACO! 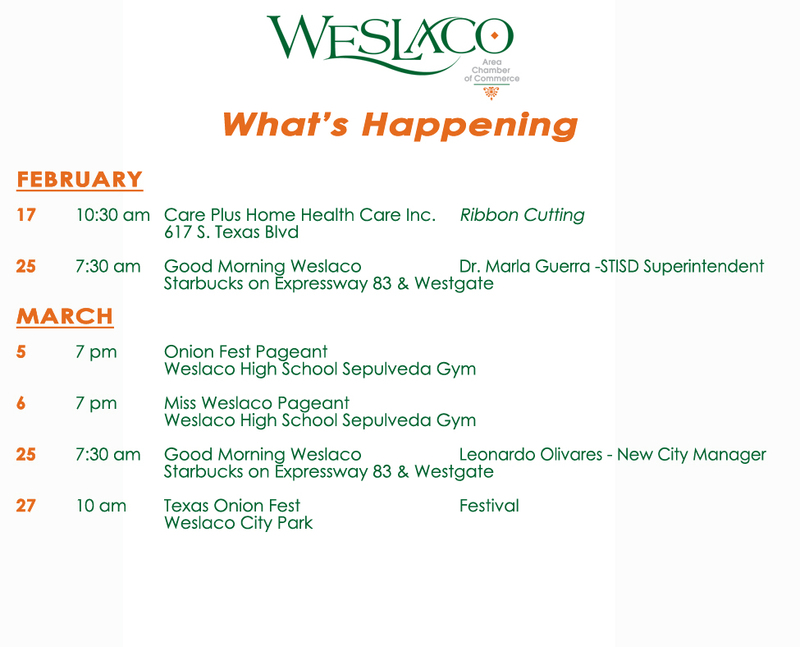 There's a lot going on...and we want to keep you informed! McALLEN--- State Representative Veronica Gonzales earned a perfect score for her voting record on environmental legislation in the 81st Legislative Session from the Texas League of Conservation Voters (TLCV). "Texas is a beautiful state blessed with many natural resources and I believe that the laws we pass should protect and preserve our air, water and land for future generations," Rep. Gonzales said. "My votes reflect that belief and I am proud to earn the League of Conservation Voters' support." TLCV is a non-partisan organization that advocates environmental protection and conservation. At the end of each legislative session, TLCV issues a scorecard grading lawmakers on a wide range of votes and issues including renewable energy, green technologies, recycling and waste disposal. Gonzales was one of only 53 of the 150 member House members to earn a perfect score on her votes for 12 bills that addressed a variety of issues including: green state building standards; cleaner vehicles for state agencies, a trust fund to help low- income residents weatherize their homes; creating financing districts for developing renewable energy sources and increasing public beach access. The league also endorsed each House and Senate members who earned an "A" on the scorecard. The TLCV 2009 Legislative Scorecard is available online at www.tlcv.org/scorecards/2009/. Please join us today to celebrate with Explosion Dance & Fitness! WE NEED YOUR HELP!!! 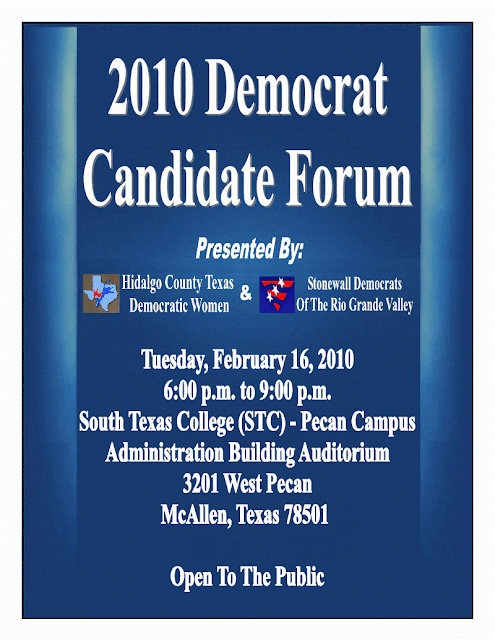 Could you be an ELECTION JUDGE, CLERK, POLL WATCHER, OR A TEMPORARY PRECINCT CONVENTION CHAIR MARCH 02, 2010, ELECTION DAY? If so click on the following link, fill out the information and fax it back to us at (956)581-0330 or contact our PRIMARY DIRECTOR, ROSALIE WEISFELD at (956)793-5814. 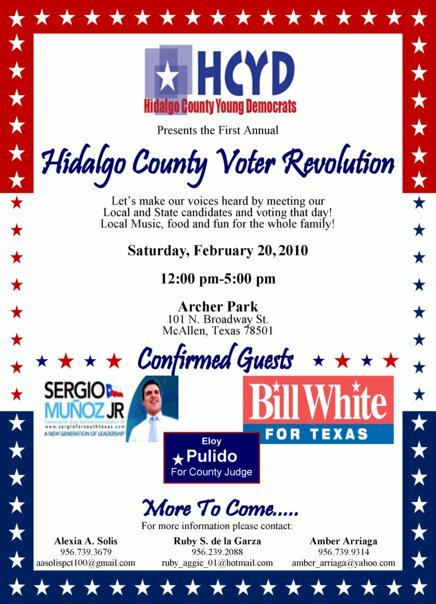 EARLY VOTING has begun and will continue till FRIDAY February 26, 2010! PLEASE HEAD OUT TO A POLL LOCATION NEAREST YOU!!! Remember that you may VOTE at ANY polling location during the early vote period. FOR A LOCATION LIST CLICK THE LINK BELOW. Candidate Forum TODAY, Come Join US! 7:00 A.M. -- 7:00 P.M. If any of you would like to see more on the firestorm between Col. Ray adn Eddie Zamora, we will be sending a link out in the next day or two from The Advance Newspaper in Pharr. Greg Wendorf, the editor, says they have interviewed both Col. Ray and Eddie Zamora, as well as an article written by Tom Haughey, Republican Party Exec. Director. Stay tuned for more on our signs. Juan has a Spanish translation of Reagan's quotes and we have some signs from other patriots that we will send along. Now, we just need a sign-making party!!! 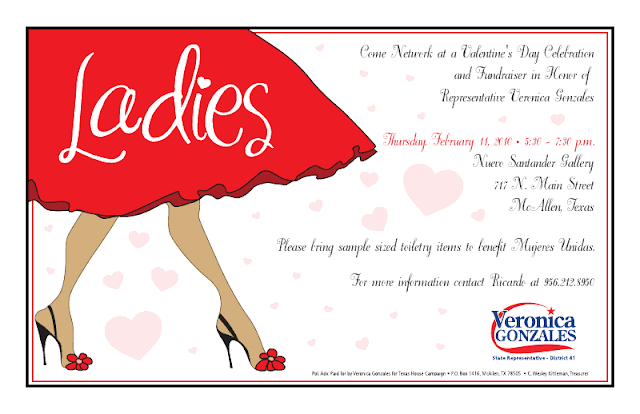 Nancy Pelosi Coming to Laredo This Friday!!! 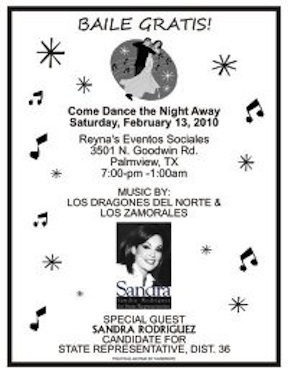 ATTENTION...........Speaker of the House NANCY PELOSI will be in LAREDO, TX. on Friday at 6:00pm at the Caballero Reception at the Laredo Civic Center on 2400 San Bernardo Ave.
Laredo TEA Party will take the lead on this welcoming rally! I will be in contact with other organizations as I encourage others to spread the word and they will be contacting Chris Bowlin to shepherd this flock. Please meet immediately to plan the "Welcoming Rally". We will need everybody's input. Call the McAllen TEA Party, Call the Boerne TEA Party, Get in touch with every TEA Party in Texas. In Laredo, we are few, but we are fierce and not afraid to let our voices be heard. 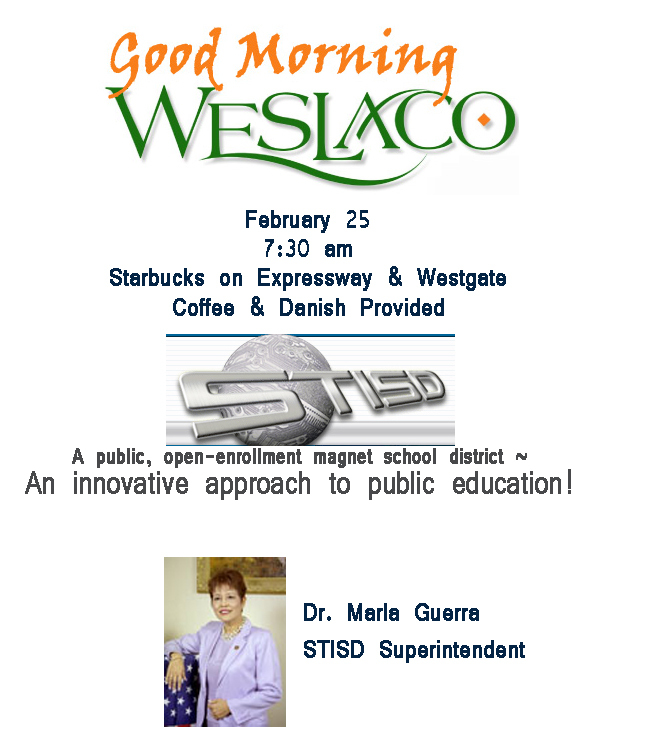 This is the PERFECT opportunity to try to help open the eyes of fellow Laredoans. Laredo is a CONSERVATIVE town but somehow is run by the Democrats who are kow-towing to their liberal leaders. Don't count on the media covering this "Rally". We need to have our own documentation of pictures and video. 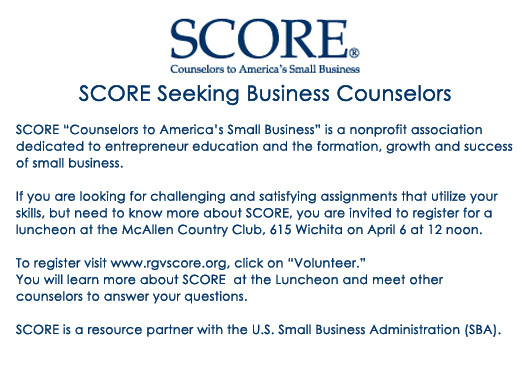 Please call Chris Bowlin @ 956-500-6601. Your candidates are failing to make the most of the money they spend on their websites, signs, TV ads, radio ads, push cards, t-shirts, and other collateral. If your candidates are on flickr, Youtube, Twitter, or Facebook and don't put their web address on their campaign material, then why bother with the social networks? What happens is that they end up friending people online who would vote for them anyway. Isn't the idea of having a social media campaign to reach out to voters who have not decided who to support? It's like having a campaign event where only your family and closest friends show up. The idea is to get the public to attend, isn't it? It's like running for an office in Hidalgo County and putting all their signs outside the county line. By not putting their website address on their campaign materials, their social media efforts are out in a dark corner of the internet where only their friends know to find them. By advertising the website, your candidates can reach those voters who want to know more about the candidates. That campaign collateral can drive traffic to the candidate websites where they will click the photos, read the material, watch the videos, and maybe even make a donation. Without driving traffic to their sites, the social media campaign is wasted time and money because your candidates are preaching to the converted. If your candidate does not do these things, then demand that they stop wasting time and effort on the web; send them block walking instead. Demand a return on your investment. Mission High School (MHS) had 41 students recently compete at the UIL Region XV Vocal Solo and Ensemble contest. 39 students received 1st Division (superior) ratings for their performances and two received 2nd Division (excellent) ratings. Of the students who received the superior rating, five also qualified to advance to the State Solo and Ensemble competition to be held in Austin in late May. Those five students are: Victoria Vielma, Patty De La Garza (pictured front row left to right) and Stephanie Robles, Elianna Perez, Joucelyn Franco (pictured back row). Bottom row (L-R):Alex Salazar, Deanna Pollard, Melissa Arce, Maria Valerio, Iris Mireles Anna Pollard, Victoria Vielma, Claudia Cueva, Patricia De La Garza, Kassandra Villarreal, Joselyn Quintero. Middle row (L-R): Gabby Gall, Anna V. Hernandez, Cassie Pereira, Jessica Aleman, Stephanie Robles, Mariagna Nunez, Joucelyn Franco, Alez Alaniz, Megan Mercado, Crystal Castillo, Gabby Vela. Top row (L-R): Liza McKenna, Yessica Perez, Theresa Alaniz, Julie Barrera, Ivan Cortes, JeNeva Jimenez, Danielle Valdez, Victor Alonzo, Jon Inman, Alain Escamilla, Brittany Castillo. Not pictured are: Claudia Alaniz, Mariela Cedillo, Sabrina Hernandez, Nacho Ochoa, Elianna Perez, Zeke Chapa, Marco Jimenez, Markus Silva. Each Mission CISD (Consolidated Independent School District) campus has announced their selection for Teacher of the Year at their school. These top teachers have now been entered into the Mission CISD Teacher of the Year program. It is from this program that one elementary and on secondary teacher will be selected to represent Mission CISD in the Regional Teacher of the Year contest. Last year, Rosa Blanton from Leal Elementary School was selected as the District Elementary Teacher of the Year and Everardo Castellano from Mission High School was the Secondary Teacher of the Year. The 15 elementary campus Teachers of the Year for this year are: Dolores Reyna, Alton Elementary School; Sonia Salinas, Bryan Elementary School; Fernando Perez, Cantu Elementary School; Roxann Martinez, Castro Elementary School; Yvonne Perez, Cavazos Elementary School; Gracie Rodriguez, Escobar/Rios Elementary School; Elizabeth Adkins,Leal Elementary School; Eduardo Martinez, Marcell Elementary School; Sandra Rios, Midkiff Elementary School; Sara McCormick, Mims Elementary School; Norma Garcia,Newcomers Academy; Antonio Urrabazo, O'Grady Elementary School; Lauro Flores, Pearson Elementary School; Nancy Cardenas, Salinas Elementary School; Nora (Terry) Gomez,Waitz Elementary School. The seven secondary campus Teachers of the Year are: Mary Solis, Alton Memorial Jr. High School; Norma Carrera, K. White Jr. High School; Val Rossi, Mission Jr. High School; Belinda Hinojosa, R. Cantu Jr. High School; Josefina (Josie) Flores, Mission High School; Liz Montes, Veterans Memorial High School; Miguel Fraire, Roosevelt Alternative School. Each of these 22 teachers is now filling out a questionnaire used in the Texas Teacher of the Year program. The questionnaires will be reviewed by a panel of judges selected from the community. These judges will make the final selection of the two teachers to represent Mission CISD in the regional competition. The judges' decision will be announced at a special Teacher of the Year luncheon to be held on National Teacher Day, May 4. Each campus Teacher of the Year will also be honored by the district administration and Board of Trusteesduring this special luncheon.